I had a combination of work, chores and errands this weekend but, everything ended on a high note. We even tackled that hideous pile of laundry I referred to earlier (you'd be proud...staying up until 2am just doing laundry. Crazy. Party. Animals). Finishing what you need to do on a major to-do list is a wonderful feeling isn't it? With so much going on externally, I kept everything simple with my outfit so I could maintain focus on my goals. It worked. The result is serenity. i adore your sunnies, love ur outfit u look so cute! 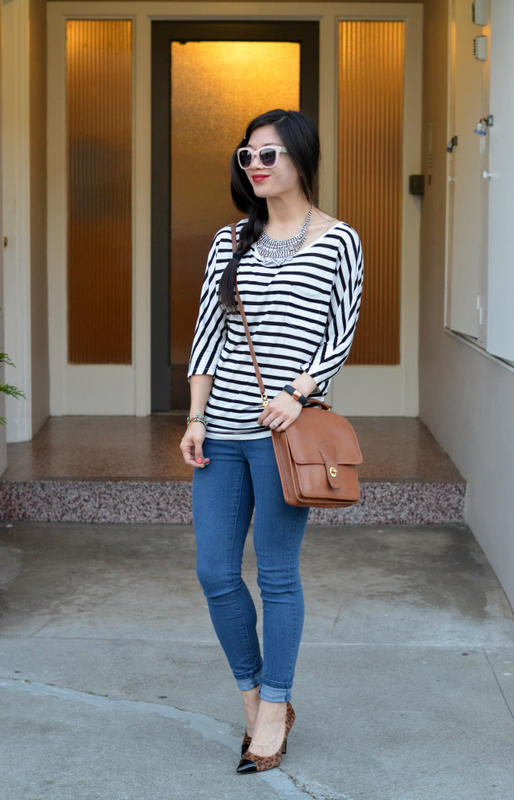 Love your top and handbag, definitely a chic look! I love this whole look. It's so effortless. And that barrette in your hair is perfect. Yay for taking care of that laundry. 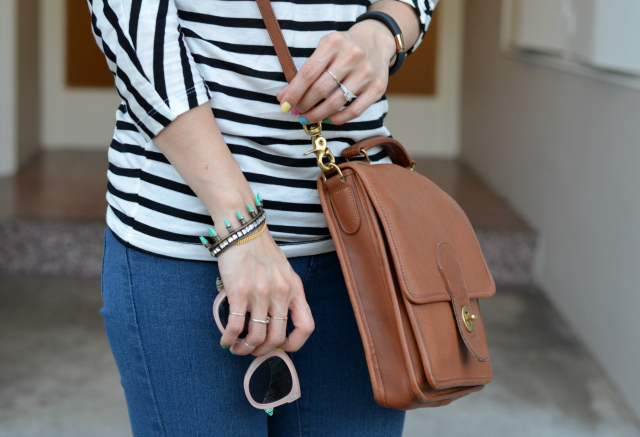 Love this combination you have going with the stripes and leopard. I practically live in striped tops and skinny jeans during the spring but my recovering ankle doesn't allow me to wear heels at the moment. Happy Monday! most definitely. i love knocking things off on a task list. one of the greatest feelings ever. and yay to laundry being done. sometimes that could be worse than washing dirty dishes! ugh. It is such an amazing feeling to get a big task on your to-do list done! I'm so happy you were able to do that this weekend :) I did as well—my mom and sisters came over to help me trim, paste and stuff wedding invites! It was a lot of fun and super helpful. I love this look so much! 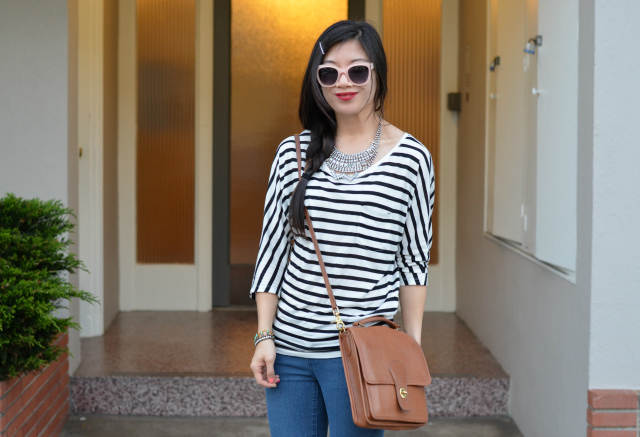 One of my favorite combos is stripes and animal print :) You look great! Have a lovely Monday. xo! Serenity indeed Nancy! That's the best feeling when you can cross things off your list! I'm crushing on this outfit! It's so cute! I always love your hair! Gorgeous! I love how classic. Yes! Finishing everything on a to-do list is the BEST feeling ever. Unfortunately, I've got a to-do list a mile long at the moment :( so I can't wait for that day it's all checked off! You look stunning as always, that bag is so perfect for summer! I love how these are all such classic basics that go together for a fabulous outfit. Love it! Your sunglasses looks adorable on you! I adore your F21 necklace - great score! 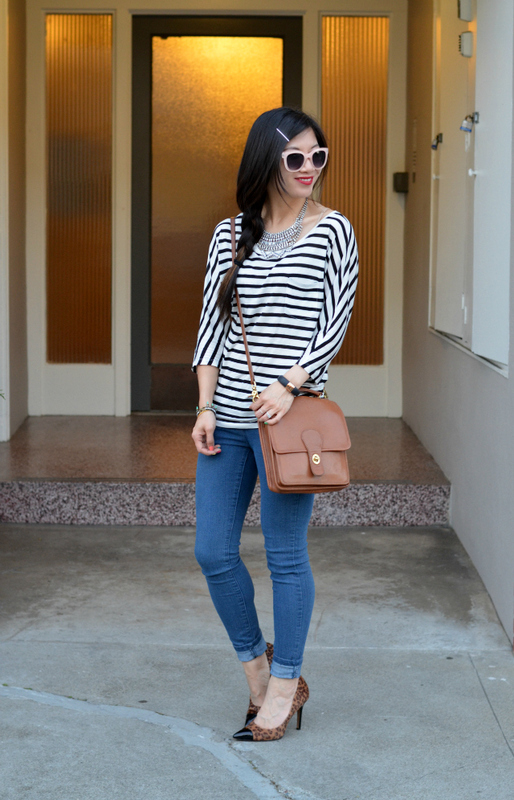 stripes and leopard! i've never seen it done before but now i totally dig it :) great look! It's been a very long time since I've stayed up past 1 am. Love this necklace - can't believe it's from F21- you always have the best eye at pieces that looks so unique!